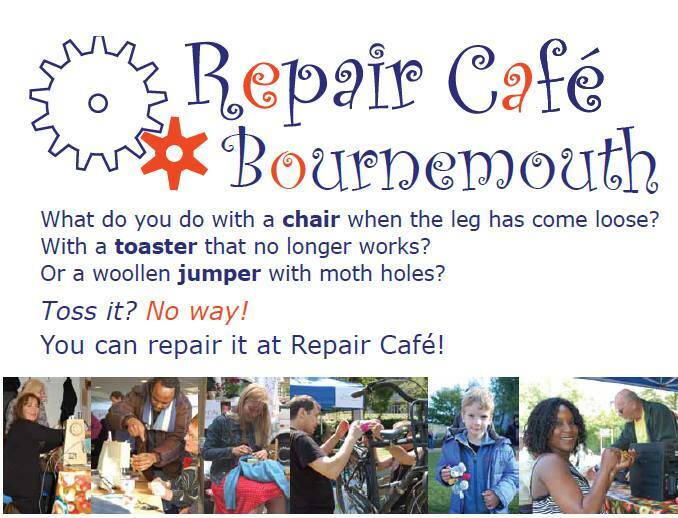 Come along to Bournemouth Repair Cafe this weekend! Our next Repair Café is coming up this weekend and it’s an extra special event as it is being sponsored by Gumtree UK as part of National Upcycling Week 2017! Saturday 24th June 2017. The Repair Cafe will run from 2:00pm until 4:00pm (to link in with the other waste related events happening at the same time). Henry Brown Youth Centre, Cunningham Cres, Bournemouth BH11 8DU. We will put up signs so you should be able to find us. The Facebook event can be found here: https://www.facebook.com/events/373435719683156/. Don’t forget to invite your friends and family along too! Our friends from the Bournemouth and Poole Sustainable Food City Partnership have another year of foodie fun planned for 2017. If you love trying new restaurants who serve locally and ethically sourced food and drink why not go along! Come along to our FIRST Bournemouth Repair Cafe on Sat 21st Nov atBeaufort Community Centre (Beaufort Rd, Bournemouth, Dorset BH6 5LB) from 1pm-2:30pm. We are joining up with Beaufort Give or Take to help you save money and keep your stuff out of landfill! Get in touch via transitionbournemouth@gmail.com to find out more or to sign up as a volunteer. On July 16th Transition BH took the opportunity to present at Bournemouth University’s 2015 Festival of Learning. Entitled “The Transition to a Green Economy – How can we achieve it in practice?”, the event brought together speakers from Transition Towns Bournemouth and Poole to engage an audience on how we can continue to make our towns more sustainable and enjoyable places to live. To begin, a video created especially for the event featuring Transition Network founder Rob Hopkins was shown. Embedded below, this outlines the rationale behind the Transition Network and how it has grown from being a reaction to the challenges facing the modern world into becoming a global movement which is rebuilding local economies in sustainable ways. There was then some lively discussion between audience members and the Transition BH panel as to how we can continue to move the area towards a greener economy. Everything from less wasteful food distribution to online co-ordination of efforts and even ambitious projects like community energy and local currency was on the table. The Transition BH panel then had an opportunity to present some of their existing and upcoming projects, underlining how much is already being done in the BH area. Attendees had the opportunity to take away flyers and information on many of these endeavours; going by how many chose to we certainly made a good impression! Transition BH is an “umbrella” group which facilitates communication and collaboration between Transition Town groups around the Poole Bay area. The PowerPoint slides used in this presentation contain details on contacting us about any of the projects discussed at this event, Click here to download the slide deck. There is lots of exciting stuff going on this weekend! A fantastic selection of high quality hardy garden plants including bedding, perennials, herbs, fruit trees and bushes, alpines, shrubs, climbers, roses and trees will be available. Everyone is very welcome. As well as plants, there will be a wide selection of stalls selling local, ethical and fairly traded produce. Free tea, coffee and squash will be available, and delicious barbecued food will be on sale. There will be live music from Cherry Tree’s very own band ‘The Propagators’. Not to be missed! Cherry Tree Nursery was set up to provide sheltered work rehabilitation, in a supportive but realistic working environment, for people with severe and enduring mental illness. Find out more at www.cherrytreenursery.org.uk. In the wake of the winter storms that have been battering the UK SAS are calling for volunteers to take part in SAS Big Spring Beach Cleans on 28th, 29th, 30th & 31st March to help tackle the marine litter crisis. Boscombe CF Steward Team, Community Event Network, Surfers Against Sewage & Boscombe Beach needs your helping hands! Join SAS and your local community on Saturday and be part of the biggest Big Spring Beach Clean ever! J oin in with WWF’s Earth Hour, the world’s biggest celebration for our amazing planet! It’s so easy to take part, all you need to do is sign up and switch off the lights for the hour, joining millions of people from across the world and helping to create a hugely symbolic and spectacular display. Whether you reflect under the stars or celebrate by candlelight, it’s a moment to say you’ll do your bit to protect our planet – not just for one hour, but every day. What will you do during the hour? Slades Farm Open Space in between Ensbury Avenue and Talbot Woods. If you are looking for somewhere to take your dear old mum on Mothering Sunday, (or need a good excuse to get away from your in-laws! ), then why not come to Slades Farm Community Garden? The garden is greening up as Spring unfolds. The willows are fluffy with pollen and bursting into green, as are the hawthorns. Some of our fruit trees have started to flower. The currents are just about to break bud and the raspberries are opening their leaves. 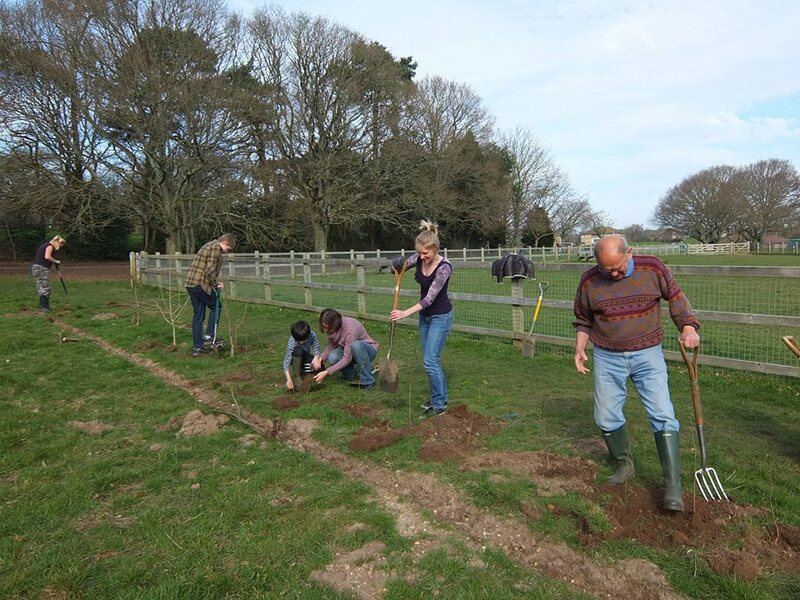 If you’d like to do more than have a look, we can offer some gentle pottering amongst the veg patches or some more invigorating exercise with hedge planting. There are still some winter greens and winter salads for harvesting, too. If you would like to do some gardening, we will have a selection of tools and gloves available, but feel free to bring your own if you’d prefer. Please wear suitable clothing and footwear. Transition Bournemouth’s Big Green Quiz 2014! On Wednesday 5th March Transition Bournemouth hosted The Big Green Quiz 2014 as part of Climate Week and Fairtrade Fortnight. The lovely Kino Lounge was almost filled to bursting with enthusiastic greenies wanting to show off their eco knowledge. Six teams enjoyed rounds on climate change and Fairtrade (of course) as well as a green themed music round and a green Bournemouth round. In the end the aptly named Green Geeks won the £50 pot which they very generously donated to Cherry Tree Nursery. All of the runners up received Fairtrade chocolate as a conciliation prize. We would like to say a very big thank you to everyone who came along and made the evening so much fun with an extra thank you to our quiz mistress Roxie, her lovely assistant Lee and of course to the staff at Kino Lounge for making us feel so welcome. We hope to see you all at another quiz very soon!